Have you found an online vendor selling Kilo Kai Spiced? For those who gave this rum a 10....what are you guys smokin'?!? This ain't even close to a ten. You want good spiced rums go with Sailor Jerry's spiced rum or El Dorado spiced rum or Old New Orleans Cajun spiced rum or Bayou spiced rum or Black Coral spiced rum or Siesta Key spiced rum. All of which are LIGHT YEARS better than the crap found in Kilo Kai. Those all blow Kilo Kai straight outta the water. And straight into the dumpster where it belongs. Whoever allowed this rum to market should be indicted and found guilty of some crime. Felonious assault on the taste buds? I knew I was in trouble the moment I took a sniff and found its odor resembling a cheap aromatherapy candle found in just about every mall. Forcing myself to sip a little I discovered that it's overloaded with not only a strong imitation vanilla extract flavor but it also has a soapy flavor to it as well. Down the drain it goes. If you come across this, do not pass go, do not collect $200 and do not under any circumstances buy a bottle of this. Not even to play a prank on your buddies. Have been a Sailor Jerry drinker for years. Then one day Jerry wasn't around... I was really in the mood for some spice and too many of my friends had been with Captain Morgan, though none seem to be in love. So, I tried Kilo Kai. Damn. That's all I can say. Had several at the bar... and am now on the hunt to buy a bottle. Or two. Had some good reviews, so I tried to. I'm not unhappy with the purchase as I was extremely curious, but the rum isn't fantastic. It's reminiscent of Kraken, but a little more.... soapy? They claim flavors of "anise, vanilla, banana, cherry, nutmeg and orange peels". I would have been happy with just two or three of those. I just can't think of a situation I would prefer this over Kraken. I'm giving it a 6, unlike Kraken which I gave an 8 (I believed), because it's not offensive. There is strong vanilla, it makes a decent rum and coke, but that soapy flavor... Not offensive, I just don't understand why anyone would want this flavor. There aren't many spiced rims in the world that I can drink without chasing but I've found one here. I don't understand what a lot of people don't like about this rum. I guess they don't like their rum to have sweet taste to it. It's pretty sweet but not all that sweet. It does burn the throat but not in an uncomfortable way. I've had Kraken, Sailor Jerry, Captain Mo, and a lot of the other rims you find in your local store and this is honestly the best Rum I have ever had so I'm gonna give it a perfect score because I just don't see anything wrong with it. Taste is delicious and smooth. Great blend of spices and flavor. Aroma, spices and, taste. We can become friends in do time. I have no complaints. Goes down smoothly, after taste good. All of personal preference..
Great aroma. Butterscitch taste with a cherry finish. A little too sweet, reminds me of a soda pop. TLDR: Good aroma. Cherry, vanilla, and banana flavor. Good price. Good for sipping, even better in a cocktail. The first thing you notice is the aroma, very heavy vanilla and cherry notes. You can't pick up any burn in the aroma. With the first taste I picked up the vanilla and cherry noted that I got from the aroma but there was also the banana that was listed on the bottles tasting notes. The banana flavor is something that sets it apart from other spiced rums I've had and I believe it tones down the burn that can be found in other rums. At 70 proof it doesn't pack a strong burn such as other spiced rims, which often tend to be made with over proof rum. I found that it was very pleasant to sip, but it was perfect for making drinks with. EDIT: I've tried some other spiced rums so far and this by far is my go to. I changed from a 8 to a 9 because this still is my favorite, nothing so far compares. Awesome! Fantastic! Amazing! YOU WILL LOVE THIS RUM! First time drinking kilo and I am surprised at how well it tastes for a cheap rum. I would put it up against rums twice even three times its cost. This rum would be a great social rum for when you want to keep your top shelve stuff in the cabinet. I appreciate the complexity, and the other flavors are nice, but the anise is just too strong for my taste and IMHO doesn’t go well with rum. Flavor of the rum itself is just OK. Since I had been to Curacao once in 1991, I finally had to add this one to my collection despite all of the mixed reviews. My first impression was that it does not have enough spices. It is also not too offensive at first. Then further tasting shows unidentifiable artificial tastes. Use your own wild imagination to describe these artificial flavors, but none of them come from tropical trees found on this desert island or nearby rain forest in Venezuela. Yes, it goes down smooth, which is probably the only reason for the high ratings on this one. Keep searching and you can find many better ones. Heck, Sailor Jerry is even better than this one. Go for Brinley Gold Shipwreck if you want one of the best spiced rums. Update two months later: This one has sat in my cabinet since first opening it and tasting only a small amount. Since it is the lowest ranked of the "spiced" rums now in my cabinet and I was tired of looking at it, I wanted to test it again to see what makes it so damn different from the rest. Well, as it turns out, this is probably NOT artificial flavors! To me, it is full of hibiscus flower!!! This is based upon my own memory of that red hibiscus tea called Jamaica found at a few authentic Mexican restaurants. There is only one problem with the only spiced rum that uses hibiscus flower. I would not exactly call it spiced. So, why don't they just call it hibiscus infused rum and we can all classify it as a flavored rum? It still rates as a 5 for me because it is just too damn sweet. If you do wind up with a bottle of this stuff or see it at a bar, may I suggest the best mixer as ginger beer. This is almost a match made in heaven, albeit quite sweet. Had a rum tasting on a sunny Saturday evening, because why not. 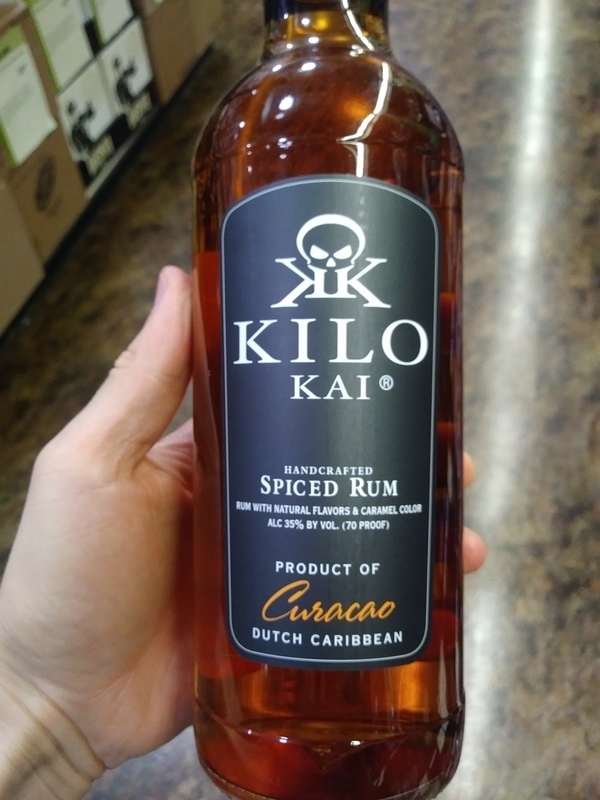 Kilo Kai Spiced Rum bottle and label design look very made up and superficial. Light golden color. Awful artificial flavor burst followed with pure alcohol to the nose and palate. Very strong burn at the end. Mix it with your favorite soda and down it goes. This rum is well spiced to the sweet side and I can see why some folks really like it. But I just can’t give a higher rating to anything that cannot stand on its own, and this one burns too much going down. Mixing it works very well for properly designed drinks, so if that’s your goal for a spiced rum, then this is perfect, especially at a low price point for something that is clearly better quality than the bottom shelf where it’s usually found. It’s quickly become my #1 rum from the first sip! It is a sweeter run, with a heavy vanilla flavor, but I’m a Rum/Diet, So with a Diet Coke it’s a perfect match! Tons of vanilla, absolutely no nuance. Aftertaste is garbage. At least it's moderately smooth. This is a 70 proof rum, which may help account for the lack of mouth burn, which is agreeable. However I didn't get a lot of "spice" notes from it, mainly just artificial vanilla and caramel flavoring. Pretty sweet too, like a liqueur or schnapps. Anyone who enjoys sipping a spiced rum neat, or on the rocks, should try Rumbullion!, it is by far the best spiced rum I've tried to date. I would buy it exclusively, if I could find it locally. Reminiscent of a root beer float, cinnamon buns and caramel. Sweet, full of flavor and smooth. Enjoyable straight up or mixed. A slight burn, which is ok, to let you know your drinking rum. Not one of the more popular spiced rums on the market but better than most of them. If you are considering trying more spiced rum but do not want to spend the money at the store and end up not liking it this is where I would start. This rum is very smooth and easy to drink. Pairs very well with Coke/Dr. Pepper and a lime. I wouldn't suggest mixing with a Vanilla product as this Rum has a good hint of vanilla to taste. I find this for $16-18 USD often and its always an easy buy at that price. Like the heading says. Tastes like floral hand soap and fake vanilla. Avoid at all costs. Mixes with nothing and smells like cheap old lady perfume. Yuck. What the F were they thinking? This rum doesn't have quite the complex flavor combination but it is still a solid choice for a rum. Sweet vanilla initial impression with lots of spice. Hints of some caramel but that is about all, no other fruits or oak flavors. The burn is a little more than I had anticipated, but not terrible. For what you pay for, it's a decent rum. I drink it straight mostly, but imagine it's good in coke. Initially I loved the smoothness, vanilla flavor, and slight burn...I am drinking some now reading some reviews about it tasting like soap, and I'll be damned if that next drink didn't taste like a mouthful of soap...that is some kind of mind trick, I'm cleansing the palet and trying again. This is one of the best tasting rums I've ever had. Shipped a bottle of kilo kai as we don't sell it locally. Smell reminds me of root beer/cream soda. Smooth rum with a very good taste overall. I kinda see what others are alluding to with the soapy taste though. Only had it straight thus far..I'll drink some more later in a mixed beverage. So far so good though. Very smooth... Nose of maybe pepper? But vanilla flavor. The more i drink it, the more "ok" it is. Smooth, buttery flavor with dark sugar, vanilla, butterscotch, candied orange, and spice. Cheap, sweet, very mixable, and a treat on its own. For what you pay, it can be a part of every bar.